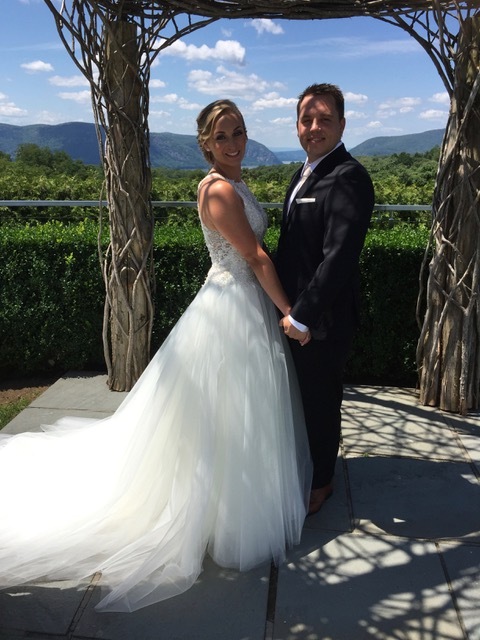 Richie and Kristen chose the Garrison Country Club in Garrison, New York for their wedding. 100 people were invited. I was honored to have officiated the ceremony for my grandson. (Check my WBP Facebook blog to see how I was asked to officiate.) The scenery overlooking the mountains was outstanding. The bride wore a beautiful gown and looked like a princess. My sons, Steven and Jeffrey, escorted me down the aisle first as officiant. The groom's father, Richard and his wife, Beth, followed taking their seats. The bride's mother, Debbie Schmalback was then followed by the groom's mother, Susan Sinoradzki who was escorted by her son, the groom. Five bridesmaids and five groomsmen constituted the bridal party. Kristen was then escorted down the aisle by her father, Hap Schmalbach. The outdoor ceremony took place under an arch made of tree vines intertwined. Following the ceremony, a cocktail hour was held indoors and at 6 p.m., a reception was held in the main ballroom. A DJ played some awesome music and everyone had a wonderful meal, and toasts by Kristen's parents and Richie's father, and Kristen's two sisters were awesome. Needless to say, it was a wonderful wedding and everyone had a great time. Kristen is a teacher for Kindergartners in Connecticut where they reside and Richie is Assistant Vice President - Business Manager for J.P. Morgan. The couple will be on a two-week cruise as the end of the month.